The first of the sewage management projects to be launched within the Namami Ganga Program is a 50 million liter per day Varanasi Sewage Treatment Plant (STP), located in the village of Ramana. Construction and operation of plant was awarded to Essel Infraprojects, a fast-growing venture led by India’s Essel Group. 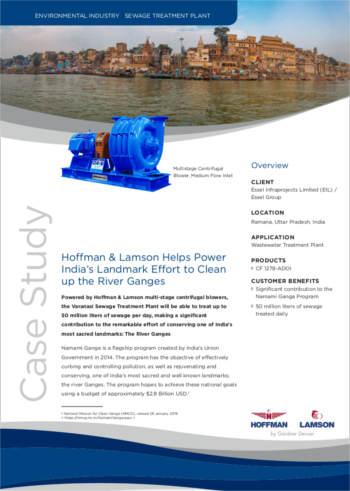 The company soon discovered that while traditional turbo units met a number of project requirements, an alternative, in the form of HOFFMAN & LAMSON’s multistage centrifugal blower technology, would provide the Varanasi STP with the combination of performance and reliability required. Read the complete case study to learn more about the application requirements, system specifications and customer benefits.